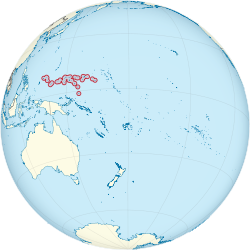 Micronesia, officially the Federated States of Micronesia, is an island nation in the Pacific Ocean, northeast of Papua New Guinea. The country is a sovereign state in free association with the United States. The capital city of Federated States of Micronesia is Palikir. The Federated States of Micronesia were formerly part of the Trust Territory of the Pacific Islands, a United Nations Trust Territory under US administration. In 1979 they adopted a constitution, and in 1986 independence was attained under a Compact of Free Association with the United States. Present concerns include large-scale unemployment, overfishing, and overdependence on U.S. aid. The Federated States of Micronesia is hundreds of small islands divided in seven territories in Micronesia. The term Micronesia may mean the Federated States or to the region as a whole. This area is in Oceania. Wikimedia Commons has media related to Federated States of Micronesia. This page was last changed on 5 April 2018, at 12:37.